Sure enough the fun seas started the minute the ship hit the Atlantic. Around 4:30 AM I was awakened by some rocking, rolling, and shimmying. Since our stateroom is aft on Upper Deck (deck 5) we get the ‘shakes’ from the engine. Normally this is soothing, but with the pitching and rolling it was a bit much. 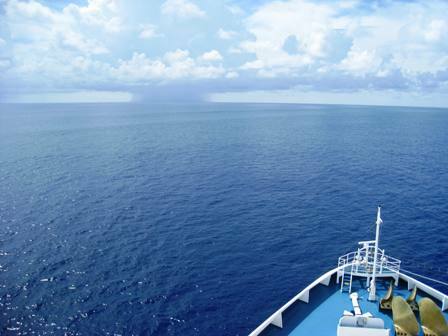 Currently, we are 60 miles off the coast of North Carolina and 500 miles west of Hurricane Bill. Despite the large swells everyone seems to be enjoying everything Carnival Pride has to offer. All three pools are packed, the casino is filled with nicotine-induced gamblers, and the bars are busy serving up the drink of the day, “Yellow Bird”. Last night’s dinner in the Normandie Restaurant was excellent. As usual the food on Carnival does not disappoint. Problem is eating too much. My teens gorged themselves but made sure to have room for the famous Chocolate Molten Cake – a diet killer at 500-plus calories! They told me they will order this every night. Ah, to be young and calorie unaware (sigh). It’s been a relaxing day reading on the balcony listening to my iPod. I use a set of small speakers and try to be diligent not to disturb my deck neighbors. 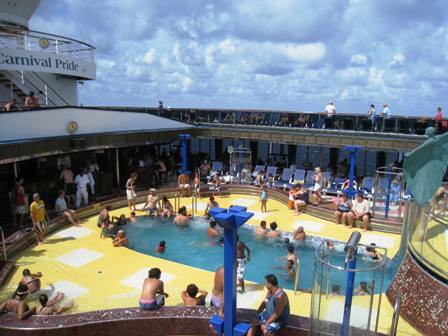 I was playing Sade and Bob Marley, in my opinion the best cruise music to play when going to the Caribbean. My neighbors, a middle-aged married couple, liked the music and asked me to turn it up so they could enjoy it too. All of us were enjoying the music, but apparently a guest a few decks away would rather hear something else and asked if I had any Toby Keith. Ugh! I have a rather large eclectic selection of 8,125 songs on my iPod, but no Toby Keith. I do have some country ‘tuneage’ so I suggested Faith Hill, Shania Twain, and the Dixie Chicks. Oh man, I said the wrong thing. Next thing I know I am getting a lecture (as well as half the ship — his voice was real loud) on those “evil” Dixie Chicks. Something about patriotism blah, blah, blah. Okay…let’s just stick to Bob Marley I suggested. He shut up. Can’t please everyone. Tonight is formal night and the captain tells us the angry seas should be calmer. Stay tuned for more blogs from the Pride. Carnival Pride Blog: Driving to a cruise sure beats flying!